This vegetarian Tom Yum is loaded with all the spicy and sour flavors that one would expect from our most famous Thailand soup, but it's made without meat, fish, or shrimp. 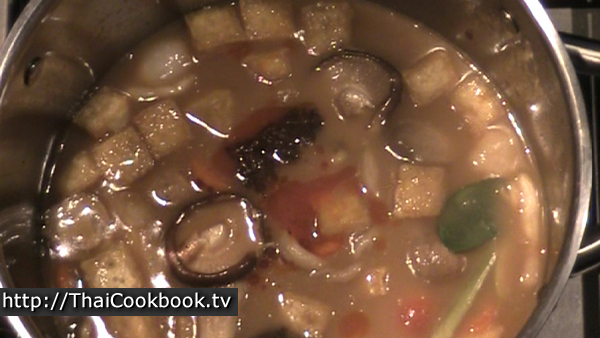 Khun Worawut starts with a nice handful of various mushrooms, carrot, and cherry tomatoes, and cooks them in a rich broth flavored with galangal, lemongrass, kaffir lime leaves, and his own recipe for vegetarian nam prik pao. The result is a very enjoyable bowl of delightful tastes. What's in our Vegetarian Tom Yum. 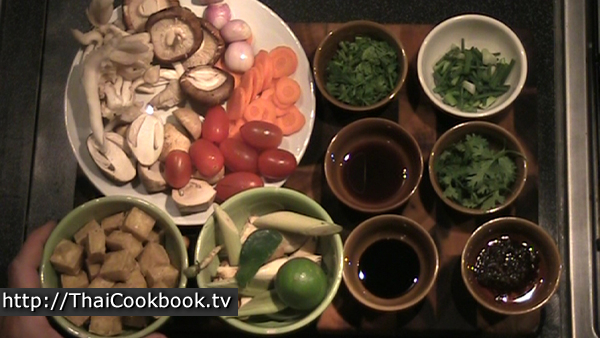 How we make our Vegetarian Tom Yum. 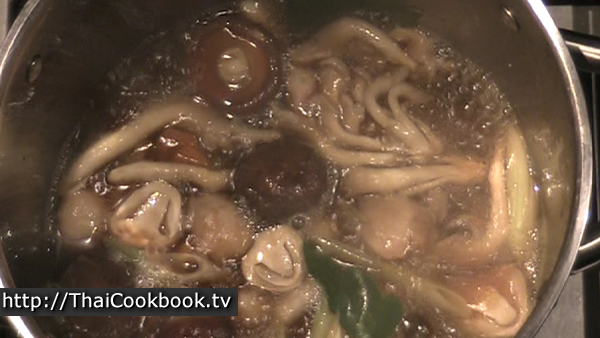 2) Add mushrooms, carrots, shallots, and any other vegetables that you like. 3) Add light soy sauce, dark sweet soy sauce, and sugar, and boil for about 3 minutes or until the mushrooms and vegetables start to soften. 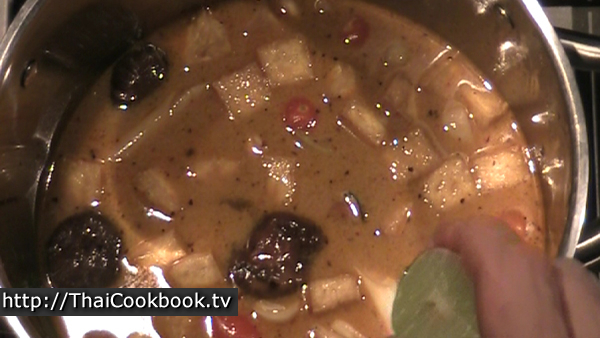 4) Add the tofu squares and tomatoes, and let it get hot again. 5) Stir in the coconut milk. Turn off the heat. Season to taste with vegetarian nam prik pao and fresh lime. The traditional recipe for Tom Yum calls for Nam Prik Pao, our roasted chili sauce. Some recipes use chili oil, which does work to make your soup the correct color, but for the right flavor you need the roasted ingredients found in a true Prik Pao paste. Nearly all packaged prik pao pastes will contain shrimp paste, fish sauce, fish, and even sometimes meats. 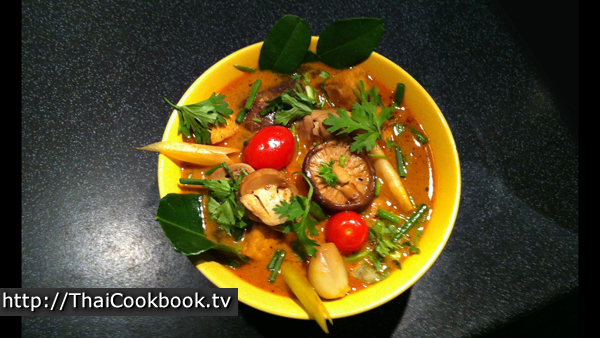 In this vegetarian recipe for vegetarian Tom Yum we will use our own homemade vegetarian nam prik pao. The recipe can be found on this page. We encourage you to make your own sauce, because as you probably know packaged products can have a lot of hidden ingredients. In Thailand you will most often see Tom Yum with straw mushrooms, but we are using a mix of straw mushrooms, shitaki, and others. Mixing them ads a lot of color and character to your soup. You can use any type you have locally available. We are using carrot, but you could also add other types of root vegetable, green beans, snow peas, etc. Avoid using broccoli or other soft veggies, as they get too soft and will change the flavor of the soup. Cherry tomatoes are recommended, but you can use tomato wedges. Just put them in the soup at the last minute so they don't get cooked much at all. 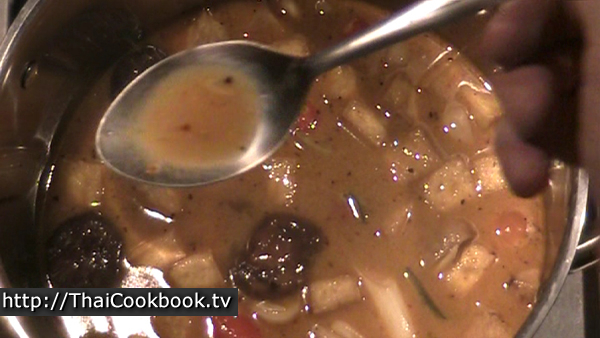 I add tofu to this recipe, and I like they way it makes the soup have a more rounded texture and flavor. 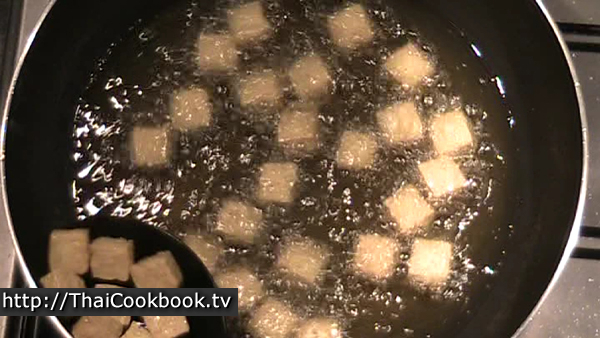 Drain the water from a small package of firm tofu and pat the pieces dry with a paper towel. Cut it into smaller squares or little triangles. Heat 2 - 3 cups of vegetable oil in a deep wok or frying pan, enough to cover all the tofu so it floats and fries evenly. Deep fry for about 5 minutes, or until golden brown and puffy. Note: You can buy these fried tofu triangles now in most supermarkets, but I like making it myself. If you don't care for tofu, this recipe is great without it. Just add more mushrooms or veggies to make 2 nice servings of soup. Cut the straw mushrooms in half, and also cut the other mushrooms small enough to eat with a spoon. Slice the carrot into thin pieces. Peel and clean the shallots, leaving them whole. Bruise 2 lemongrass stalks by hitting them lightly with a mallet or the handle of a heavy knife. Cut the bottom portion into 2 inch diagonal pieces. 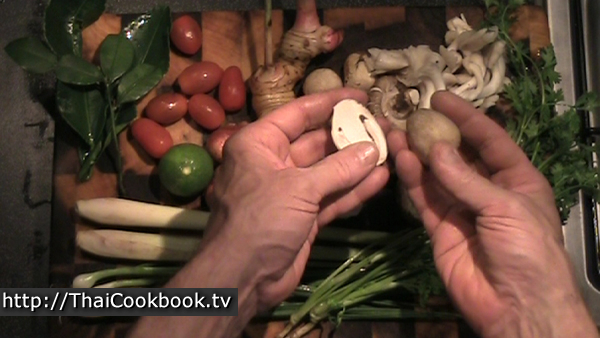 Clean and slice the galangal into 1/4 inch pieces. Clean the coriander roots well, and bruise them a little. Tear 2 of the kaffir lime leaves in half down the middle, and remove the main stem. Save 2 other nice looking leaves to use as a garnish. Remove about 10 nice leaves from the tops of the cilantro sprigs and save them to use as a garnish, then roughly chop the rest of the stems and leaves. Cut the spring onion into 1/2 inch pieces. Measure the sauces, sugar, nam prik pao, and salt, and put everything together for quick access, as the soup cooks quickly and you need to be ready. 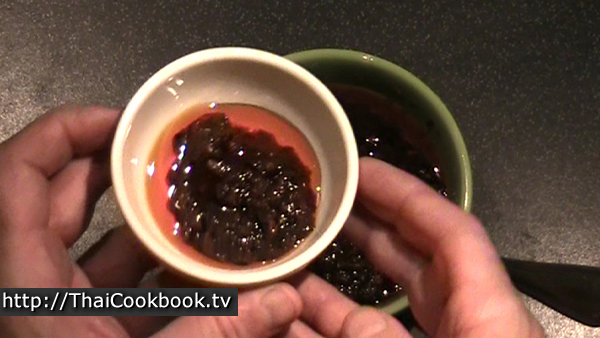 Bring 3 cups of water to a strong boil in a medium sized soup pot or a large wok. 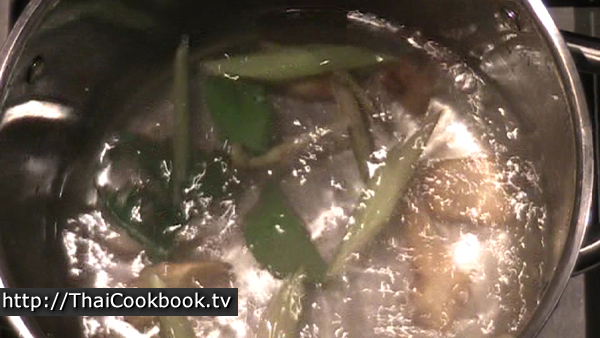 Add the galangal, lemongrass, kaffir lime leaves, and coriander roots. Boil the herbs like that for about 5 minutes, until a lot of the oils come out and add a nice flavor and aroma to the water. 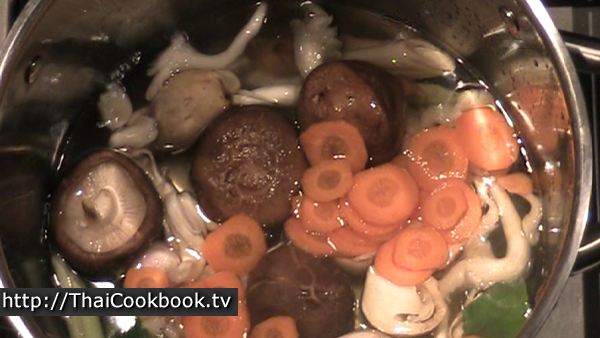 Add the mushrooms, carrots, shallots, and any other vegetables that you might be using to the herb broth. Bring back to a boil. Add the light soy sauce, dark sweet soy sauce, and sugar, and boil for about 3 minutes or until the mushrooms and vegetables start to soften. Add the tofu squares and tomatoes, and let it get hot again. Turn off the heat, then add about 1 - 2 Tablespoons of vegetarian nam prik pao. Stir it in well. Add the juice of 1 lime, stir it in well, then taste the soup. It should be spicy, a little sour, and a little salty, but not too much for you to handle. Tom yum is always a little too spicy with the first taste, but you get used to it while you're eating it, and each bite becomes more and more delicious. Use a little more nam prik pao, more lime, and add salt if you think it needs it, tasting until you get it just right for you. 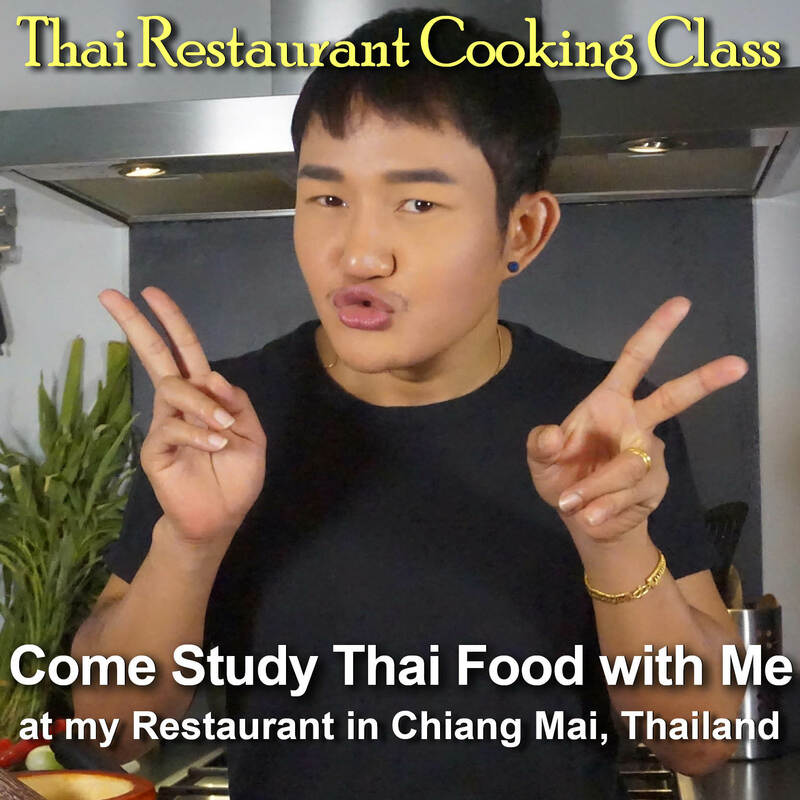 Thai cooking is always seasoned to taste. 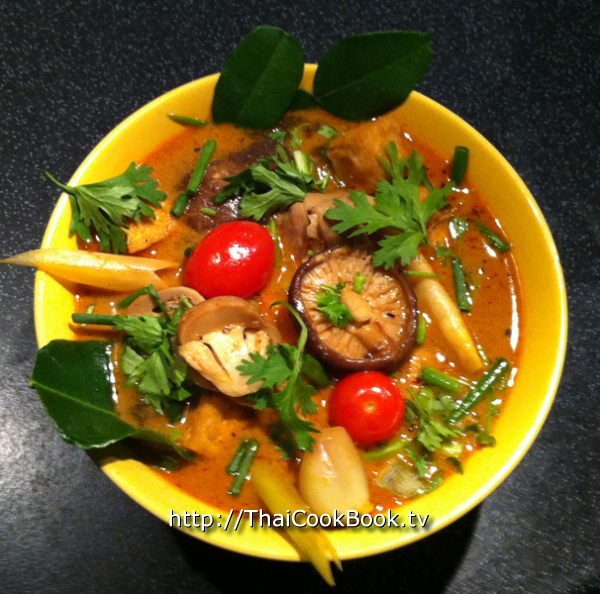 I like my Tom Yum very spicy, so I would add the whole 3 tablespoon of prik pao in mine and then still maybe want more. Ladle the soup into a single bowl big enough to hold both servings. Arrange the mushrooms, lemongrass, tomatoes, and other ingredients on top so they look nice, then sprinkle some chopped cilantro and green onion around on top. Place a few cilantro leaves here and there, and stick in some kaffir lime leaves along the side. 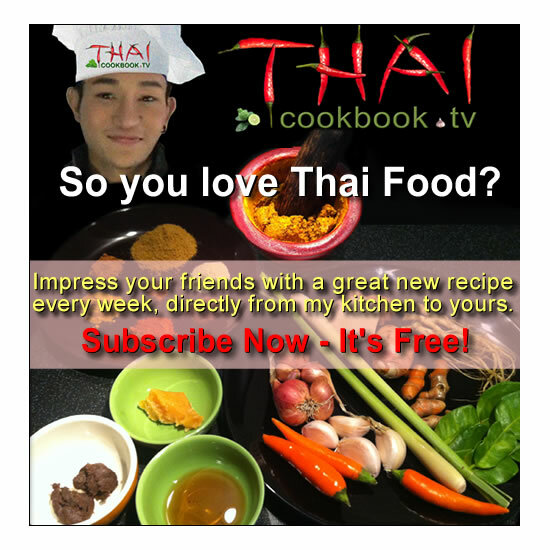 Serve at the table from one bowl which is shared, then each person should have a small plate of hot steamed Thai jasmine rice, or for a non traditional twist you can serve a nice hearty brown or red cargo rice. Tom Yum is always eaten with rice in Thailand, but you can skip the rice if you prefer to just enjoy this wonderful soup all by itself.